The Scars of Cruelty: Biological Effects of Parent-Child Separation – Patrick F. Clarkin, Ph.D.
Kelly seemed to be saying that children would be cared for and not put in any physical danger, though that does not always seem to be the case. The Department of Health and Human Services admitted that it could not account for 1,475 migrant children who had been placed with sponsors. During the Obama administration, some unaccompanied children who were in foster care ended up in the hands of human traffickers , indicating that policies and procedures that were “inadequate to protect the children in the agency’s care.” Also, the ACLU reported that unaccompanied immigrant children detained by U.S. Customs and Border Protection faced “pervasive abuse and neglect,” as well as denial of basic health care and being allowed to stand or move freely for days. For its part, the CBP denied the allegations (though there were 30,000 pages of them). Deportations during the Obama administration also led to thousands of children being separated from their parents as well, and many children have arrived at the border unaccompanied by an adult, so children being apart from their parents is not entirely new. 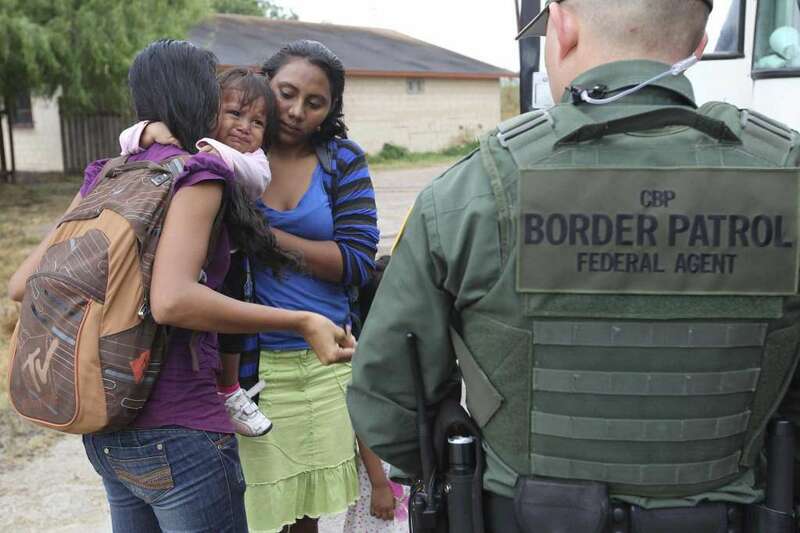 What is new is the deliberate separation by U.S. officials at the border, creating a problem where there was none. “Pediatricians work to keep families together in times of strife because we know that in any time of anxiety and stress, children need to be with their parents, family members and caregivers. Children are not just little adults and they need loved ones to comfort and reassure them. Like Nguyen, I don’t think I can fully comprehend how hard it would be to have a child taken from me. On an emotional level, I think the closest word to describe how I would feel would probably be “anguish” for my child’s pain, and probably “anger” toward the people who caused it. On an intellectual level, I think most of us would probably feel this way, and I think I know why. Forgive me, but I cannot help but to view all of this at least partly from the perspective of a biological anthropologist. Perhaps this is going back one step too far, but I think it’s important to remember that some of the hallmarks of being human are (1) our obligatory sociality, and (2) the intensity of the parent-child bond. Connections are essential, as none of us is an island. For example, large epidemiological studies show that strong social relationships are a better predictor of longevity among the elderly than whether one is obese or exercises regularly (Holt-Lunstad et al. 2010). Similar patterns have also been found in baboons, where females who had stronger and more stable social bonds lived longer (Silk et al. 2010). If such connections are important for older primates – including humans – with a lifetime of experience behind them, then they are even more important for the young and vulnerable. Primates tend to have singleton births (one at a time) instead of litters of offspring, and they are altricial at birth (highly dependent), requiring years of care. As mammals they require nourishment from their mother’s breastmilk. And they also require a feeling of security, as Harry Harlow famously demonstrated decades ago. 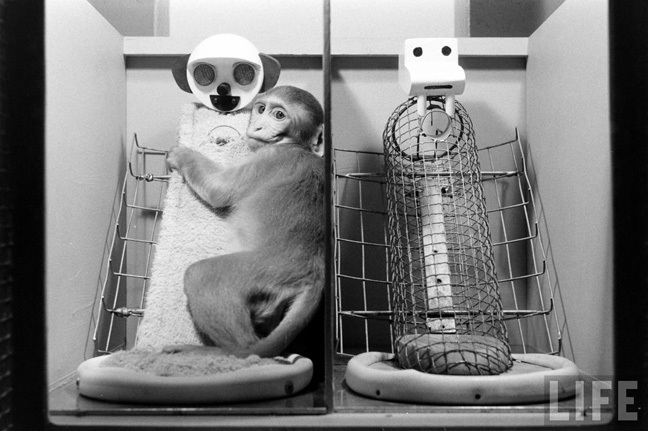 In Harlow’s experiments with infant rhesus macaques (monkeys) they were given a choice of surrogate “mothers” – one made of wire that provided milk, the other covered in soft terry cloth but provided no milk. Infants spent up to eighteen hours a day with the terry cloth surrogate mother, an indication that for young monkeys attachment and security were equally as important as nutrition, if not more so. Harlow also completely isolated infant monkeys for lengthy durations, some for 3, 6, or 12 months (Harlow et al 1965). Among the eighteen infants, they showed an array of behavioral problems, including anorexia, self-clutching, aggression, fear, and stunted sexual development. The ones who were isolated the longest fared the worst; Harlow et al noted that “12 months of isolation almost obliterated the animals socially” (p. 94). Isolated monkeys did not learn as well as controls, but due to the small sample size this was not statistically significant. They noted that “we can, however, state with confidence that the ‘intellectual mind’ is far less crippled than the ‘social mind’ by prolonged total social deprivation if adequate experience is provided subsequently” (p. 95). Of course, children are not monkeys, or any other type of animal. But there are lessons we can draw from other species. The Central American children separated from their parents will not be completely isolated as Harlow’s monkeys were. Nor will they be isolated for months. Still, there is evidence that even brief maternal separation in young mammals can be detrimental. In a recent study, Sarine Janetsian-Fritz and colleagues removed 9-day old rats from their mothers for 24 hours (Janetsian-Fritz et al 2018). They found that even this brief, but stressful, separation had long-lasting behavioral and physical effects, including mild memory impairment, less communication between brain regions, suggesting “increased probability of developing psychopathology later in life.” In another study, young infant rats that received less care and grooming from their mothers were more fearful and anxious. These effects were lifelong and were caused in part by epigenetic changes to genes affecting their glucocorticoid receptors (Weaver et al 2004). Similarly, maternal-infant separation also affected the epigenome in rhesus monkeys, with different amounts of DNA methylation in both prefrontal cortex and T cells (Provençal et al 2012). In children, neglect and a lack of adult attachment in infancy has been associated with a range of developmental delays. Romanian institutionalized children who lacked attachment with an adult since infancy showed delays in cognitive function, motor development, language, as well as socio-emotional behaviors. They also had more psychiatric disorders and altered of EEG patterns. Fortunately, some of these deficits were reversible if children were placed into quality foster care at younger ages within a critical age of development. However, for children who face a range of adverse experiences, some effects can last for a lifetime. In one sample of 132 older adults (average age of 69), adverse childhood experiences – including abuse, loss of a parent, or lack of at least one close relationship with an adult – were correlated with a range of physiological effects including shorter telomeres, which is associated with premature aging (Kiecoty-Glaser et al 2011). British and Finnish children who were evacuated to safer areas during World War 2, but who were separated from their families, grew up to have higher risk of depression and clinical anxiety (Pesonen et al 2007; Rusby and Tasker 2009), and a higher risk of cardiovascular disease and type 2 diabetes (Alastalo et al 2009). 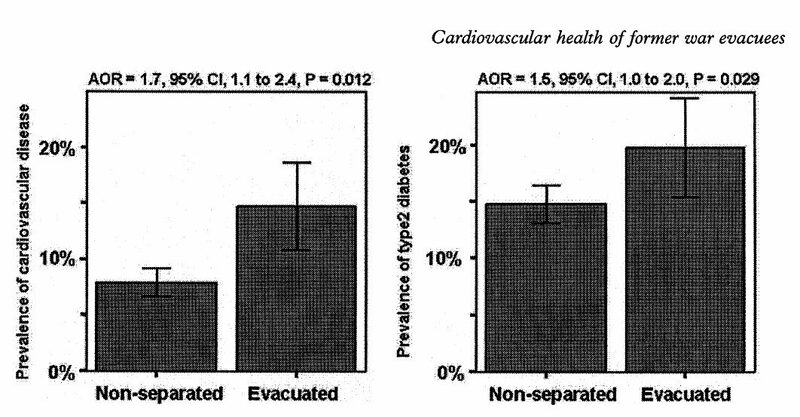 Adjusted odds ratios for cardiovascular disease and type 2 diabetes among Finnish adults who were evacuated as children during WW2 and separated from their families (Alastalo et al 2009). This entry was posted in DOHaD, Embodiment, Immigration, Refugees and tagged Central America. Bookmark the permalink. Pingback: Most Americans Disagree with the Policy of Parent-Child Separation (But Not All) – Patrick F. Clarkin, Ph.D.